What is the service like at Grace Church? Worship services at Grace Church are liturgical — following a set order of prayers. Collects, Old and New Testament lessons, Psalms, and Gospel readings are based on the church calendar. The sameness and continuity of the liturgy with music and song gives comfort and a spiritual familiarity to our worshipers, involving the whole person and all of the senses in congregational participation. 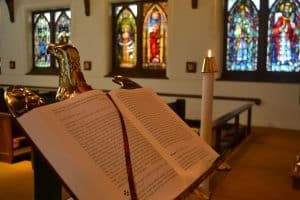 At Grace Church, the Sunday Eucharist contains two liturgical focal points: The Word of God and Holy Communion, which are found in the Book of Common Prayer. 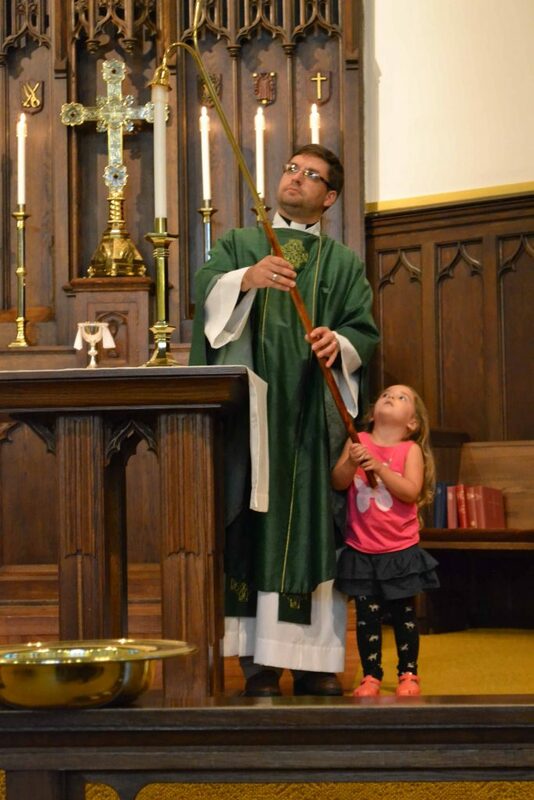 Our entire Sunday Worship service at Grace Episcopal Church is called the Holy Eucharist. The word “Eucharist” is an ancient Greek term meaning Thanksgiving. We celebrate Holy Communion each Sunday in recognition of the Lord’s commandment to “Do this in remembrance of me.” Christ is truly present to us in the Eucharist. Our service begins with a procession led by the Crucifer, followed by the choir, servers or acolytes and the priest. Lessons are read from the Old and New Testament, the Book of Psalms and a reading from one of the Gospels. The sermon or homily follows with a recitation of the Nicene Creed and the Confession of Sin. The Peace of the Lord is passed to our neighbors with a handshake or a warm greeting. The second portion of our service is the Great Thanksgiving where we unite with all of creation seen and unseen in the praise of God. This part of the service includes the offering and consecration of the bread and wine by the priest, as together we proclaim the mystery of faith: Christ has died, Christ is risen and Christ will come again. This is followed by the Lord’s Prayer, and then the distribution of the bread and wine, or Holy Communion. All are welcome to come to the communion rail for the bread and the wine, or to receive a blessing from the priest. You may either stand or kneel at the communion rail. The service concludes with prayers and the dismissal. In the same manner as the service began, the service ends with a recessional hymn and organ postlude.